It seemed overwhelming and daunting when the word “STOCKS” comes in play. The old school would probably say, just look for a broker and/or just apply yourself by commuting your way to their office but COL Financial has done it differently. 1. Visit the COL Financial Website and click on the OPEN ACCOUNT link. 2. Read thoroughly on what ACCOUNT TYPE would you possible want to enroll. 3. Accomplish the Application form online and have it printed. You may also just print the document and fill it up manually. 4. If you live near COL Financial, you may personally hand the forms and deposit your investment at their office or you may also contact COL Financial to have your requirements picked up. All checks must be payable to COL FINANCIAL GROUP, INC. Please include your Name and COL Account No. at the back. It was easy breezy. The messenger went to my place early in the morning. You’ll be able to receive a notification email from COL Financial upon receipt of form. As soon as the check has been deposited and cleared, you’ll receive your username and password instantaneously. Upon approval and process of my account. 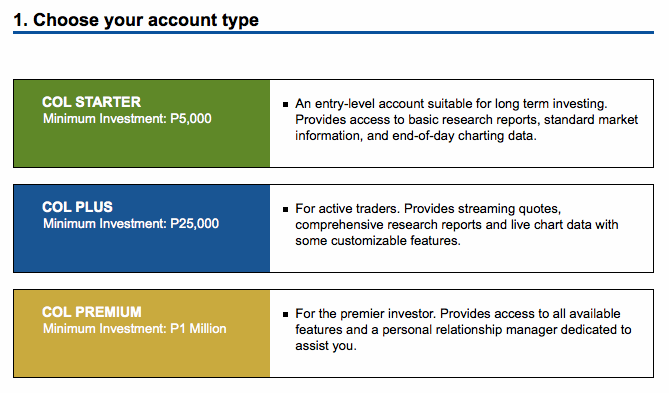 I hurriedly logged on my BDO online portal and enrolled COL Financial in order for me to add more funds to invest once I start trading. How convenient, right? Go ahead and open an account today!